Squeeze down quaint cobbled streets, immerse yourslef in the local culture and have the freedom to be stopped in your tracks when you discover the best cities in the world by bike. Whether you want an affordable way to sightsee, to keep your fitness levels on track or simply want to explore the city at your own pace, we've rounded up a list of our favourite cities with beautiful bike lanes waiting to be wandered. Amsterdam is famous for its bustling bike lanes, and it's no wonder since over 800,000 are occupied by the city's residents. With four times the number of cars on the road, cycling remains one of the most popular ways to get around this quaint city, plus its relatively flat surface provides an elaborate network of scenic cycle-paths to try out while you're visiting. Explore the capital's artistic heritage and flit between galleries in the popular Museum District, go a little further and discover the buzzing neighbourhoods of Oost and Noord, or pause for an hour or two at one of the cosy cafes that fringe the canal. Watch where you're going though, as over 15,000 bicycle's end up in the canals each year! Discover more of the city's hidden gems when you cycle off the beaten track in Amsterdam. There are 125 miles worth of cycling trails that criss-cross Barcelona's old quarter, a great way to tick off the sightseeing spots in the city. There's a variety of cycling routes to choose from, so you can get to know Barcelona from a different point of view - for panoramic views take the Montjuic Route up the Olympic mountain, or for scenic parks and iconic monuments take the Ciutat Vella Route. Pedal at your own pace and explore the city's architecture, including the famous Sagrada Familia or lesser-known Palau Güell, Casa Batlló, Torre Bellesguard and Casa Vicens. For lush interiors, take a break from the tyres and pause for a picnic at one of the city's parks, with Parc de la Ciutadella , Parc de Joan Miró, and the Montjuïc Castle some of the finest spots. If you want to discover more of the city, browse our list of the top 8 things to do in Barcelona for our favourite picks. Berlin is another city in Europe where bikes are a way of life. With cycle-paths stretching 900km across the city (and bike's comprising 13% of traffic) this stunning capital is wonderful for exploring on two wheels. Discover the Berlin Mauerweg, a scenic route that takes you along the historic Berlin Wall, or try out the paths within Treptower Park, where you'll stumble upon war memorials, pleasure boats, restaurants and beer gardens - the perfect pit stop. Parking is easily available and there are streets that give cyclists in the city priority. 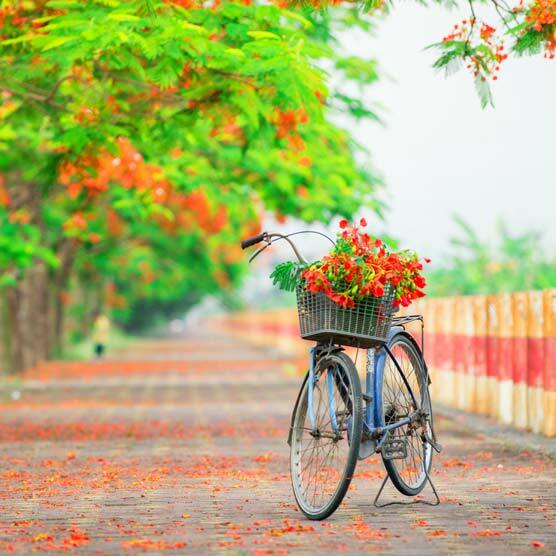 The capital of romance is one of the best cities to explore on a bike, with an abundance of quaint streets, famous landmarks and scenic parks to discover. The city's Vélib’ rental scheme has over 20,000 bikes, roughly 1,800 stations dotted around the city and over 90,000 daily users - so picking up a pair of pedals is easy. There are a variety of cycling routes available whether you fancy parading around the parks (ideal for a picnic break), soaking up sights along the River Siene or heading into Paris city centre. Of course, the bikes are light and stylish in true Parisian manner, so you can ride up to Champs-Elysee, tour the Eiffel streets or venture to the Latin Quarters and scenic Odeon districts in ultimate style. Denmark’s capital city is one of the most beautiful in Europe, and is aptly known as Cycle City. It has consistently ranked among the top bike-friendly cities with 16 new bridges and a host of other biking infrastructure. This is the only city in the world to create a Biking Highway too - a pathway that joins suburbs to the city centre. Grab your wheels and explore a variety of pathways based on your interest, including contemporary, national and historical trails. Visit the century-old amusement park Tivoli Garden and admire picturesque grounds and thrilling rollercoasters, or head to the solitary Little Mermaid statue at Langelinje Pier. During the evenings, ride through Nyhavn, the wonderfully preserved 17th-century waterfront. Portland is among the few cities in United States that uses bicycles as part of the eco-friendly commuting infrastructure. With over 315 miles of bikeways, there's plenty of opportunity to explore this exciting city on two wheels. If you're visiting in June, Portland cyclists organise a medley of fun-filled public activities and bike rides known as "Pedalpalooza" to celebrate the arrival of summer - including Jazz rides, fancy dress, midnight mystery rides and more - with family and adult-only specific events. Roll down to Powell’s - the largest new and used bookstore in the world - park up and potter around the exquisite Portland Japanese Garden or get a taste of urban life in the city centre. Montreal is one of the top North American Cycling Cities with dedicated bike lanes and a robust bike-sharing system. A large number of people use the bike for their commutes, and tourists can easily get by with a rented bike and map. Bike up your way to the Mont-Royal and admire breathtaking views from the Belvedere observatory, and if you're up early enough, you'll get treated to a gorgeous sunrise.